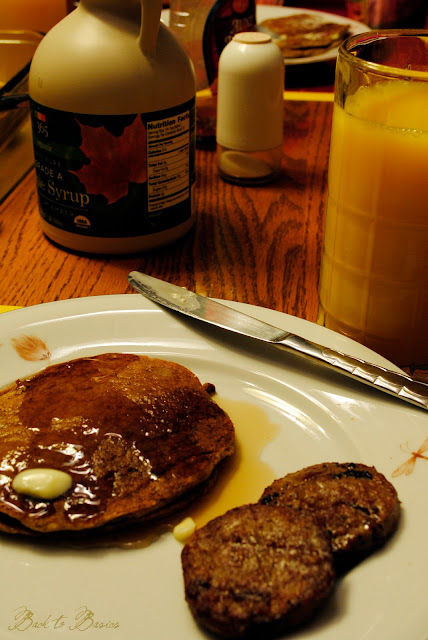 We love breakfast for supper, and these really hit the spot last night when it was cold and rainy. Combine the flour, brown sugar, baking powder, baking soda, allspice, cinnamon, ginger, and salt. In a separate bowl, mix together the buttermilk, pumpkin, egg, oil, and vinegar. Stir the flour mixture into the wet mixture until just combined. Heat a lightly greased griddle over medium heat. Pour a 1/4 c. measuring cup full of batter onto the griddle for each pancake. When pancake is full of bubbles, and you think it needs flipped, wait another minute before doing so. Flip, and cook until browned on the other side. These do take slightly longer to cook than traditional pancakes. Serve with real maple syrup. I've never had a pumpkin pancake. My kids love them and I know I would too since I love anything pumpkin. I can't wait to try them! How many does this recipe feed? Ben and I are making them on Friday and want to feed 10-12 people.